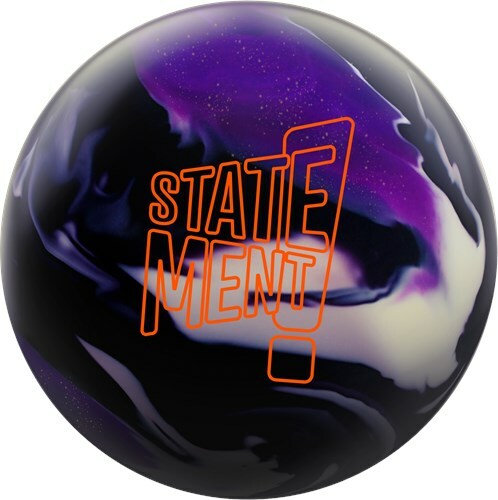 Hammer wants you to make a statement with the Hammer Statement Solid High Performance Bowling Ball. This ball uses the high traction Aggression Solid CFI coverstock which is finished with a 500/2000 grit sanding. The coverstock offers lots of traction in heavy oil and lots of continuation downlane all the way through the pins. The Statement core in this ball has a very low RG with a high differential as well as a strong asymmetric core. This core design helps the ball rev up in heavy oil conditions. The design of this core places the majority of the mass at the bottom of the core which assists in storing energy. This bowling ball is Carbon Fiber Infused! Carbon fiber is one of the toughest materials on earth. Hammer decided to add this material to the inner core of this ball for added strength and durability allowing them to offer an incredible 3 year warranty. Likes: The Statement Solid rolled very similar to a Rip'd Solid but with a much stronger mid lane movement and very strong continuation through the pins. The Statement Solid will deliver the goods and make a strong Statement on medium and heavier oil patterns for sure. Likes: I drilled this up on Saturday & was able to use Sunday morning in a friendly competition. The Statement Solid is a Beast. I was able to move way in away from the traffic and really open the lane. The ball reads the mid lane very well and continues thru the pin deck hard. The 10 pin never had a chance, but I did leave a few 9 pins. I like everything about this ball. I think it will really shine on longer or higher volume tournament patterns. Likes: I used a Pin Down 60 x 5 x 70 and left it factory box dull finish. The Statement Solid is a Monster Heavy oil ball. I love the aggressive cover and the ball gets plenty of pick up on the back end. Dislikes: Most of my arsenal is drilled for PBA and Sport pattern conditions. You need oil to use this ball and it will fit rev dominate or speed dominate type of players. This is what the Statement Solid is built for. Heavy oil conditions. The new Statement core wrapped with the Rip'd Solid Coverstock makes a great combination and new edition to the hammer line. You will not be disappointed with this ball on medium to heavy oil conditions. I am able to get a strong mid-lane roll, and this ball hits hard. Don't wait and get your Statement Solid now! Likes: This ball was intriguing to me. I decided to not do the same layouts I did on my Rip'd solid as this ball is more continuation downlane. Its a perfect compliment to the Rip'd for me as I can just expect more downlane so changing balls does not make me change lines as the Statement is cleaner and has more pop downlane. I am amazed for the surface this ball has to see what it offers downlane. Can't have one without the other! Join Lane Side Reviews as they make a #SOLID #Statement with Hammer's new #STATEMENTSOLID. Page created in 0.684 seconds with 23 queries.